What is InkThrift PRO ink? Pioneers, Innovators & Experts in Digital Printmaking since 1984. What K7 ink set is right for me? What Pro ink set is right for me? InkThrift PRO (dye inks for large format PRO printers and Photo Stylus printers read on! It is hard to imagine in a world in which higher and higher fade resistance ratings are delivered month after month, that a high-tech ink company like Vermont PhotoInkjet would develop a dye based product. Well, we are and the reason is quite simple. Pigment inks, especially high-tech pigment inks, are very expensive for us to make and for customers to buy. The simple reality is that many users of expensive inkjet printers do not actually require pigment ink because they produce short-life graphics. InkThrift dye ink is 1/10 the cost of Epson pigment ink. In this type of economy, it is wise to be frugal with materials if the application supports using a dye based solution. InkThrift can dramatically reduce your square foot printing costs while providing print head performance, the likes of which you may have never experienced before. Most short life graphics are unnecessarily printed with pigments, when InkThrift dye ink would be sufficient and actually quite superior for many applications. In fact, if you need to produce short-term glossy photographs, trade show graphics, or posters we can absolutely knock your socks off with glossiness. 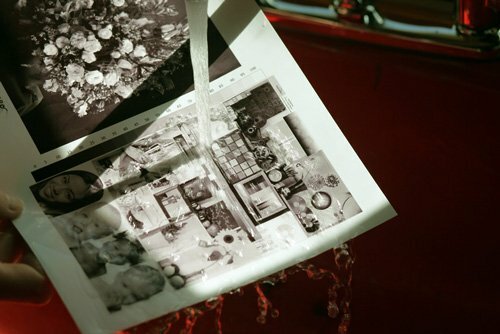 InkThrift inks deliver a glossiness that Epson pigment inks cannot. Pigment is a solid material that must compete against the glossiness of the paper it is printed on. InkThrift not only produces significantly better glossiness, but it achieves higher dMax, and is far less prone to metamerism. This is the deal-sealer and you can see for yourself by ordering up an 5″ x 7″ sample. You can print the comparative image on your own system with your own Epson inks. One look side-by-side, and you’ll be convinced. You can download the test image from the Instructions tab on the sample page. Dye inks have historically been water soluble and therefore inappropriate for outdoor use. But, InkThrift dye ink utilizes an encapsulated dye molecule so that is highly waterfast. We’re not suggesting that you place your prints under water for display. But, you might accidentally submerge InkThrift dye ink, or unintentionally expose it to water and it will not run. Whatever your experience has been in the past, InkThrift dye ink should not be lumped in with cheap China inks. It may be priced low, but InkThrift is a strong, high-tech product that deserves a place in your large format arsenal. It may not only be perfect for cutting costs and saving money. It may also allow you to get the jobs requiring higher gloss or better dMax or better shadow separation in high chroma areas. Short-life graphics do not need to last three years outdoors or over 100 years indoors. Typical short-term graphics are printed for temporary display in trade shows, for presentations, for head shots, for menus, flyers, for books and catalogues, posters for dormitory rooms, signage, hand outs and scrapbooks. This is what InkThrift PRO is designed for. Short-term graphics rarely need to be displayed outdoors for more than three months, or displayed indoors for more than 30 years. Many in fact, need only last a few days, weeks or months for a presentation or trade show. Pigment is totally over-qualified for short-term graphics. If you need to display artwork or photography indoors for a few decades, InkThrift may be an option for your work. If your work is destined to be exhibited in a museum, InkThrift is 100% archival and can have better longevity than C-print and Ilfachrome in these conditions. If you need to display photographs in areas which get a significant amount of light, or displayed under flourescent, or sell to customers who you can not control how they will display them - then you should choose pigment. We have prepared a document about displaying InkThrift PRO in both safe and non-safe indoors display conditions including longevity in these various conditions. You can read that here. InkThrift is certainly less prone to clogging print heads than is pigment! InkThrift can also be jetted at extremely high speed. InkThrift dye inks are not suspended particles as are pigment inks, so it has incredibly long shelf life and can be kept in printers for much longer than pigment inks. You can buy cheap dye inkjet printers, but these are not built for professional use nor have the desirable three blacks nor HDR options. Epson builds extraordinary large format professional printers, but does not offer a dye option. InkThrift is now the high standard dye ink option for Epson large format printers. InkThrift is a very high-tech ink that is formulated around an encapsulated dye molecule. Encapsulation of dye molecules is rare. Vermont PhotoInkjet already offers an encapsulated pigment particle. InkThrift is a breakthrough in technology that allows us to offer a strong dye formulation that is more resistant to fading than ordinary dye ink. The reason that dye inks fade so quickly is because the dye molecules are prone to breaking apart. When a molecule breaks and free radicals are produced, rapid fading results. By encapsulating the dye molecules, we greatly slow the formation of free radicals from disturbing other molecules. The end result is that InkThrift is a very strong dye ink and with very good water resistance when dry. Further, the color strength is enormous. But, color strength has always favored dye over pigment. We suspect that artists will find favor with InkThrift. We’re very serious about it ourselves. We designed ink sets for the latest of Epson large format printers. We can supply dye based inks for the Epson 4900, 7900 and 9900 as InkThrift HDR and we supply an InkThrift K3 system for use in Epson Ultrachrome printers. You will want to produce custom ICC profiles for these inks. They will not be color compatible with Epson pigment inks. For color compatibility you should use ConeColor Pro pigment inks. However, the cost of using these dye inks is so low you can afford to buy your own ICC Profile making system such as Xrite ColorMunki! InkThrift ink is compatible with both dye based printers and pigment based printers. However, if using in a pigment based printer, it is important that you replace the entire ink set at one time. We do not recommend that you change one position at a time in a pigment printer. Dye and pigment inks should not be printed at the same time unless you wish to be experimental. InkThrift ink is low-cost enough to act as a flush. After installing the dye based InkThrift into your pigment printer, perform an ink Initialization or perform at least three POWER CLEANS to remove all of the pigment inks in your pro Epson printer's lines and ink dampers, and replace with fresh InkThrift. For desktop printers, a few head cleanings is all that is required. InkThrift ink is designed for Epson PRO printers which use eight ink positions or more and to be used for prints that are not destined to be displayed for very long. It's a product designed to save as much cost as possible while producing a very high quality print. We also make a more stable dye ink called InkThrift CL which has greater longevity and is a close match to the Epson Claria ink set. It's designed however, for six ink printers. If you want a matching ink to the Epson inks for your Pro printer - we make ConeColor Pro. © 2017 Vermont PhotoInkjet, LLC. All Rights Reserved.